Cabinetry is so important – especially in a kitchen, and especially in a kitchen with an open layout. 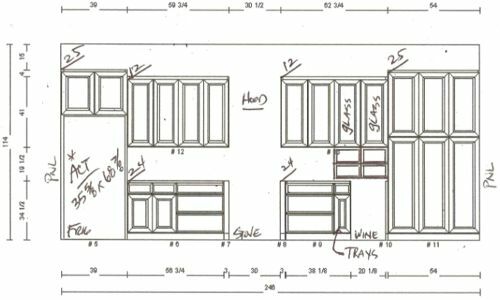 Not only do the cabinets need to offer lots of storage and functionality for cooking and casual dining, but they need to be beautiful and help create a workable flow throughout the entire kitchen, family room and dining area (some would call it a great room, so let’s go with that). That’s a tall order!! 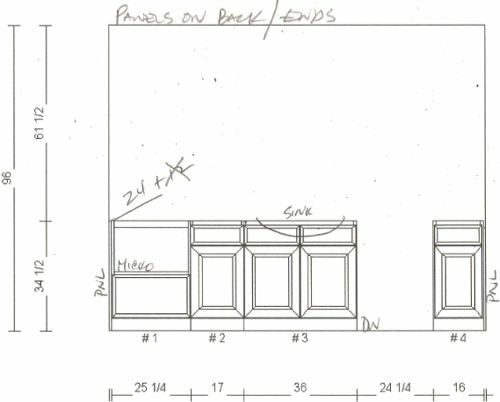 The cabinetry at the flip is going to be beautiful but it’s been very tricky to figure out. We’ve been through about 4 rounds of drawings, and realized at the last minute that we didn’t have enough space between the kitchen and the family room to have bar stools on the back of the island, so then we were scrambling to find another place to put them. 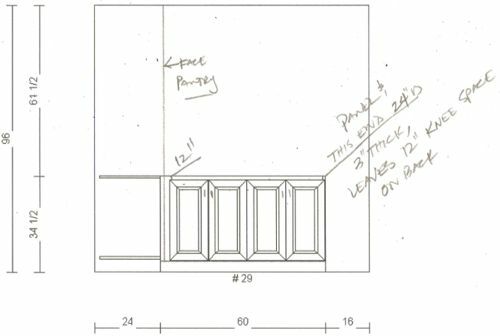 We decided to do a peninsula at the end of the back wall of cabinetry, and I think it’s going to be awesome – much better than our original plan, actually. By extending the cabinetry towards the French doors and then extending the peninsula out into the space, the room will feel more balanced whereas before everything was skewed towards the fireplace wall. Whew!! We went through lots of trial and error, but I think we finally got it right. I’ll be on pins and needles for the next few weeks, waiting to see how the finished cabinets look! Liz, this is totally AWESOME! The design improvement is terrific, but how did you ever figure out the schemitics to show us the improvements? I am so impressed for both reasons! 4) not having the bar in the middle makes it so those seated there don’t have their backs to the “den” part of the great room. I am totall certain the planner of my home’s original design did NOT spend a fraction of the time working out the best options. That’s fantasitc rendurring. What software do you use? I just posted a blog post about our kitchen cabinets. It’s amazing how important they are. They have to look good AND be funtional? What? LOL! 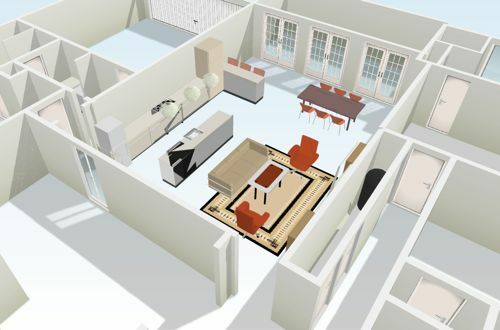 I used Floorplanner.com for the 3D floor plan, and the cabinet renderings were drawn by our cabinet maker. 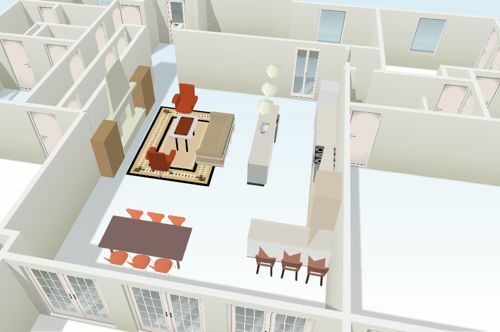 I looooove floorplanner.com, it’s such a great (and free!) resource! This is going to be gorgeous, Liz. I esp. love the layout, it’s unique and so functional. I love that the cabinets are along the largest wall. And, so much cabinet space. And pantry space. They look like they will be lovely. Heck yeah it’ll have a wine fridge! :) We thought about putting pendants over the island and the peninsula, but we worried about blocking the view through the French doors . . . hmm. HI! 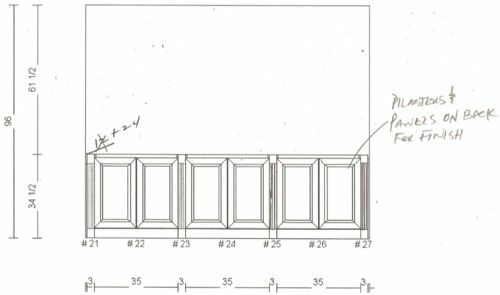 I’ve been following your blog and love it especially since I too live in Dallas :-) How did you choose your cabinet maker? I’m in the midst of a full kitchen remodel and finding one is a bit overwhelming so I was hoping you could provide tips. Hey there! To be honest, with all 3 houses we’ve just used the cabinet maker that our contractors typically used – so that’s 2 different cabinet makers, and we’ve been really happy with both. Feel free to email me if you’d like their contact info!